GREAT! Now there is absolutely no excuse for me to make for not filling my elk tag. A company called Tracking Point has manufactured “Digital Tracking Scopes.” It is basically the same targeting system they use to on military jets, for your rifle. The view through a tracking scope is simply a magnified view of the target along an axis parallel to the rifle barrel. The shooter first “tags” a target by choosing a desired impact point on the target’s surface. 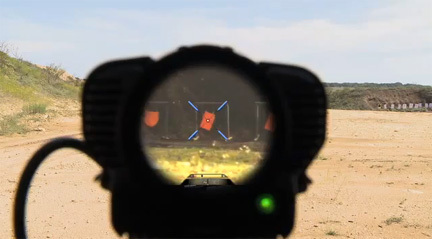 An electronic display adds a red dot that indicates the desired impact point, which remains fixed on the target as the direction of the rifle changes.